While looking for something new to watch I randomly chose a DVD with an interesting cover. 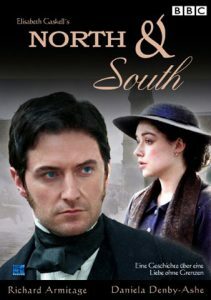 Like the average American when I saw the title, North & South, I assumed it was a drama occurring during the civil war. I was surprised to find that the story was based in England and the battle was not on grassy hills but in the cotton mills during the end of the industrial revolution. To my delight the main characters’ relationship reminded me very much of Elizabeth Bennet and Mr. Darcy from Pride and Prejudice. As we follow Margaret Hale and John Thorton’s ups and downs we get a glance into the lives of the working class whose conditions would have OSHA up in arms. I recommend this DVD to Jane Austen lovers and those interested unions and strikes during the 1800s.